What Happens When Takeout Rates Go Up? HANA has a link to a bizarre takeout increase that occurred at a now defunct dog track. The legislation notes that expected revenues will decrease, including amounts that go to the government, thanks to the takeout hike. "The bill is anticipated to result in a decrease in General Fund revenue of $27,000 per year and a decrease in revenue of $23,000 per year to the municipalities that host pari-mutuel and off-track betting facilities. This revenue loss is due to an expected decrease in handle of 4% from the Plainfield Dog Track, the Bridgeport Dog Track, and Connecticut OTB. Total handle is anticipated to decrease as a result of an increased takeout rate (1% on WPS, and 3% on exactors) because there will be less money returned to bettors for re-wagering." The THOROUGHBRED TIMES reported, "Total commingled handle at the three New York Racing Association racetracks has surpassed $2-billion so far this year, increasing by more than $200-million, or 10.4%, over the handle registered at the same time in 2001." The handle on NYRA races has reached $2,128B, with NYRA Chair Barry Schwartz attributing the surge "to the takeout reduction that has been in place since July 25, 2001," which has "returned an additional $46.4-million to bettors." Additionally, Schwartz credited the NYRA's new media efforts, including wireless technology initiatives, for the increased handle (THOROUGHBRED TIMES, 9/28/02). NYRA went ahead with a 1% takeout increase across the board in April of this year. The increase was planned well in advance, so they had a chance to stop it. The result of the hike? The last meets at Belmont and Aqueduct are down about 17% in handle, a much higher than the industry average. ADR officials said CERA was developed by the Swiss research-focused healthcare company Roche to help patients with certain kidney diseases and anemia. Like other blood-doping agents, it boosts red cells in the blood so they deliver more oxygen to muscles. The drug lasts longer and requires fewer injections than EPO. Human competitors have recently tested positive for CERA, and it is widely believed the drug is being used as a performance-enhancer in equine sports, officials said. I wonder if this means some high percentage trainers come back down to earth. Especially high percentage absentee trainers. They might wind up having to actually train horses again. No time line is given on when testing for CERA will commence, or in what jurisdictions. Chantal Sutherland to represent Canada in Hong Kong's Cathay Pacific International Jockeys’ Championship on December 9th. But before getting too excited, the average horse went for $5,364 compared to an embarrassing $3296 last year. How much does it cost to feed a horse a year? And if you take out Kentucky Bear, who sold for $100,000, the average would barely be $4,500. And lets not forget, this sales is totally propped up by sales vouchers which are accumulated by winning connections throughout the year. The actual new money pumped into the sales is laughable. 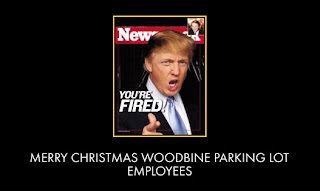 Last weekend, Woodbine informed the parking staff that they will be outsourcing the parking lot and that they will no longer have jobs comes early January. Employees, many who have been around for over 7 or 8 years (some over 25 years), were given a severance check, and told their benefits, including their pensions would be toast. They were also told that there might be an outside shot that the new company in charge of parking MIGHT hire them. More cost cutting by Woodbine. Trimming jobs (so that executive bonuses can be intact?). Last year, Woodbine got rid of all talking heads on their HPITV channel. 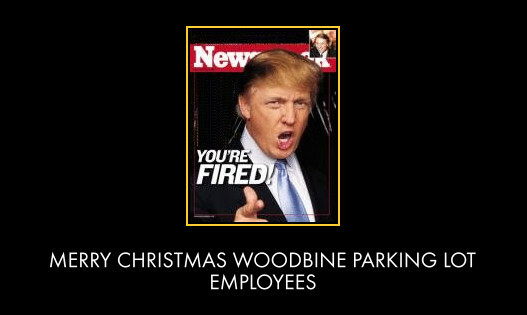 Woodbine Entertainment continues to be an ineptly run old boys network, completely out of touch with their customer base. Tampa Bay deserves some applause. They have announced on their website that they have lowered takeouts on a few of their bets by 1%. Pick-3, Pick-4, Super High-5, Pick-6 19% Reduced from 20% last year! Exactor 20.5 % Reduced from 21.5% last year! And Canadian bettors need to realize that if they cash a Pick 3 or Pick 4 at Tampa Bay through an HPI outlet or at Woodbine or tracks that use HPI, you will receive at least 6% less than what the actual Tampa Bay payoff is. Theresia is a very devoted HANA member. I don't think she has missed a Wednesday night HANA board member conference call since HANA sprung onto the scene a little over a year ago. I've missed the odd conference call for the record. Since HANA's inception, there have been no known takeout increases by any track in North America. We've seen a few minor decreases, and at least that is a step in the right direction. To join HANA, click here, it is free with no obligations. The more bettors that sign up, the more clout HANA will have going forward. Fort Erie Race Track is not the only track where efforts against closing are happening. Check out the Blue Ribbons Downs mess. Still no word one way or the other. This is starting to remind me of the movie Groundhog Day. Meanwhile, the proposed car racing track is being fought by a group of Fort Erie residents who believe that noise pollution, wetland issues, traffic congestion, and lower property values will arise if the track is developed. My wife signed the petition to prevent the development, I did not. Bringing in thousands of people to spend money in Fort Erie, creating jobs and hopefully some spill off of auto fans taking in a day at Fort Erie race track (assuming it doesn't close) outweighs the negatives. I also think it will increase property values because there will be full time workers that will drive up real estate prices. The noise won't be constant. Just a few bad days a year. Pollution? Already there. Trucks idling at the Peace Bridge will do that. And wetlands? Lots of wetlands in Canada. We are still a sparsely populated nation. How many times does a small town get an opportunity like this?, if the opportunity is actually a real one (which I have my doubts about). That being said, I have no interest in ever going to the car track. It just doesn't appeal to me at all. Good quality replays of all WEG races can be found there. "On November 28, jockeys across North America will unite to support Canadian rider Julia Brimo, who suffered head and back injuries in a spill at Keeneland Race Course on October 30.....On November 28, jockeys across the continent will wear the name “Julia” on their boots to show solidarity. Some will also donate one riding fee to a fund in her honour." To donate to the Julia Brimo Fund send a check made out to Cindy Werner at 1116 Flat Rock Road, Louisville, KY, 40245. Could A National Lottery Help Racing Grow? I read an article at Paulick Report that I found interesting, Keep It Simple And They Will Come. It definitely sounds good on paper, but when thinking more and more about it, the idea of a lottery to attract horse players may not be feasible in North America. In Sweden there is a lottery called the V75. It is simply a pick 7 for a Saturday harness card. Players can bet as little as 10 cents. The combos can be completely computer generated, partially computer generated, or completely generated by the player. From Wednesday to Friday, tickets can be purchased in a variety of ways. Typically, over $10 million bet each week. The takeout is 35%, and the remainder is paid out as follows: 7 winners 40%, 6 winners 20%, 5 winners 40%. Obviously, this attracts newbies to the sport. Free past performances are offered as well as expert picks to try to give players of all sorts of racetrack knowledge all sorts of avenues. So could this work in Canada, for example? Yes, and no. I don't think tracks will benefit greatly from the proceeds of such a lottery, however, it might work as a great way to get interest from new players. But attracting enough money to make this attractive may pose a problem in itself. Our very popular Lotto 649 attracts usually between $11-$15 million a draw (which happens twice a week). Players know the minimum payoff for a jackpot is at least $2.5 million. This can't come close to being achieved when dealing with just 7 horse races. Even in the most competitive fields handicappers can pick the winner 22-27% of the time. It takes 10 competitive races to make it so that the odds of winning with this type of percentage is 3.4 million to one. So if 7 million $1 tickets are bought, on average, there would be two winners each week (I do think a $1 base bet is required because this needs to compete with the 6/49 and the size of the jackpot needs to be big). Will the idea of selecting 10 races be too tedious for horseplayers, and perceived as too difficult for non horse players? I'd have to say yes. That is hurdle one. Lets assume that 10 races are picked out from Saturday. It would have to be 100% Canadian content for this to work, so it would be only harness racing during the winter, and could be mostly thoroughbred racing during the rest of the year. Ideally you want races with more than 9 horses, but in the winter that might be very difficult. What would the takeout be? Remember, for this to work it would have to be available at lottery kiosks across Canada. Lotto 649 only pays out around 30 cents for each dollar bet, and they don't have to split that with the tracks. Lets say a deal is reached, and the takeout is 60%. Using precedence set when it comes to slots profits in Ontario, 6% would go to tracks and another 6% to horsemen. Now how exactly would those profits be divided up? Is it divided up by home market from where the bet is made?, do the tracks that are involved in the actual races get to split the profits?, are the profits just divided up to be distributed by each province? Ideally, it should be prorated by the race dates each track offers. 6% of $5 million is nothing to sneeze at each week, but the reality is that it might only work out to $15,000 or less for each track to split up. But this could definitely get many new people interested in horse racing. Problem is that if they find that pursuing the game is futile, their interest will not be held. And if they find themselves going broke too quickly while giving the parimutuel pools a try, they will give it up as well. Ideally, this lottery idea could be fantastic for horse racing, if it was coupled with much lower takeouts at all tracks. A surge of interest could be created if the word on the street is that the game could actually be beaten. And at the very least, the newbies created get some bang from their buck. Would I play this bet? If the jackpots were usually at least a million I would. I spend around 10 bucks a week on the 649 (you can't win without a ticket), even though I know the takeout is 70%. I would just stop playing the 649. I'd rather sink money into going for a million or two each week on something that is based not just on random luck. Speaking about harness racing in Ontario which is on life support right now "Putting on a bunch of races and expecting people to come out and bet on them is a thing of the past and just doesn't work anymore." This statement is true off all horse racing. And the obvious solution cited by Darling and many of the commenters is to reduce track takeout. In Ontario, because of slots, most B and C tracks purse money comes from slots. It is actually safe for them to experiment with lower takeouts on that basis. They aren't dead yet, but dieing fast. The industry is just at the date reduction stage, Ontario harness isn't Quebec....YET. The time is perfect to cater to the horseplayers big time, and actually grow the industry. However, the big bully in the room named Woodbine Entertainment Group can make life very difficult for any track that offers lower takeouts. WEG can refuse to put the tracks on their betting menu, they can refuse to put the track on HPITV and even prevent HPITV from being available in a certain area. WEG can also ramp up the takeouts to their customers like they do with many US tracks where they give less money to winners as they base triactor and superfecta bets on a 25% takeout, if the real takeout is lower than that (this would at least not affect those who bet live on track at a harness track that offers a lower takeout, but affects overall chance of external growth for that track). Small Ontario tracks can always offer their own ADW service. They don't have to go to the expense of developing one either as there are white label ADWs out there like EBET Online who have already signed up with tracks like Colonial Downs. This would cater to their immediate home market, and I see no reason why they couldn't compete for other markets as well. Wouldn't it be great to see some competition to HPI? Competition would be phenomenal for horseplayers, and therefore it would be great for the racing industry. Imagine another Canadian based ADW for a track with a very low takeout that also may give decent rebates to its account holders. Sure, Woodbine would blow a gasket, as they still think they are entitled to monopoly like status. But it has been lack of competition that have driven horse bettors offshore and to Betfair, and lack of competition that has driven horse players away from horse racing altogether, and most importantly has lead to virtually no new horseplayers in the last 15 years, especially. The B and C tracks of Ontario are in a perfect situation to act now and become leaders in growing horse racing again. They can possibly get together and offer 12% takeouts on all bets, and this network of tracks will become very popular amongst bettors. On track they will be giving out more money than ever before, which will cause players to last longer, and the ball will get moving that way. Once the pools start increasing, which will occur as well, I can see even thoroughbred players from the US being attracted to the B and C Ontario tracks. Eventually though, because of success, I believe all tracks in North America will drop down to 12%, or they will die. But Ontario racing can have a nice head start, and start getting people hooked again. See also In A Nutshell, over at Pull The Pocket and Warnings From Ontario. Jordan's fate rests on the outcome of split sample test. I still think banning the horse and punishing the owner is the wrong way to go. Many owners have no idea what the trainer putting into the horse, though some do, I feel the ORC should have proof that the owner was in on it before suspending the horse and the trainer. In other words, Hollywood Hit should not have been denied to run in the Breeders Cup Sprint. The racing industry is in desperate need of owners. And the last thing it can afford to do is chase them away because of actions done by trainers that are out of the owner's control in most instances. I'm all for severe punishment against trainers as a way to deter cheating but that is where it should stop. Good for the ORC on this one. These type of punishments may actually deter the odd trainer from cheating. Response to a NY Times poll complete with point counterpoint video has produced 70% picking Rachel Alexandra over Zenyatta. The Daily Poll over at Paulick Report has completely opposite results with 69% choosing Zenyatta. Over at Pace Advantage, 58% have chosen Zenyatta over Rachel as well. Talk about a horse race. I vote Zenyatta. She won the Super Bowl (lets forget the fact she is a she), and like Rachel Alexandra was undefeated for the year. Youbet merger with Churchill Downs is under some scrutiny. The price of the stock could have been driven down since late July, and the shareholders are only to receive around three quarters of what the stock was trading at during its 2009 high. Churchill Downs is not known for being player friendly. They had something to do with the takeout rise at Calder in 2008. They have a reputation for bullying competitors and horsemen groups as well. Youbet on the other hand was starting to become horseplayer friendly. They were giving special advertised bonuses on cashed tickets as well as special unadvertised rebates for bigger bettors. 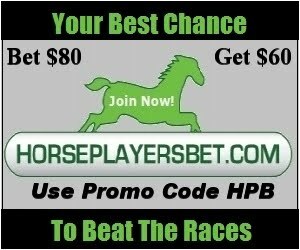 Horseplayersbet.com could be the most horseplayer friendly ADW out there today, but that is another story. I assume Twinspires will continue continue rebating its Youbet customers who qualified, because a huge part of the deal was taking over the Youbet customer base. And the last thing they should do is chase these players away. But Churchill Downs is like Woodbine South when it comes to perceived contempt for the horseplayer, and the fact that they are monopoly driven which is what is causing the death of horse racing, so who knows? Churchill Downs isn't creating new horseplayers, they are just taking more from a shrinking pie. The only thing that promotes growth in the horse racing industry right now is through rebaters which allow players to last longer and possibly win. As players last longer, they devote more of their entertainment money specifically towards horse racing, and the more time they bet, watch races and handicap, the more likely they are to expose new potential players to the game. The industry should fear Churchill Downs. Inevitably moves like this will cause more tracks to have less dates, and many will be forced to close down. Seriously, since 2003, I must have heard that the track has been sold 15-20 times. Never happens. Hopefully one day it will. It is that time of year again, when horseplayers around the world focus on two (should be one) days of championship horse racing. For me, it is eenie meenie minie, moe time, more or less. I feel much more comfortable handicapping races where at least one third to one half of the field have raced against each other recently, and at least three quarters of the field are circuit regulars. Needless to say, this isn't the case when it comes to the Breeders Cup. I'm going to admit it now, this year, I actually put in some time handicapping. I spent half of yesterday trying to figure out the cards at Santa Anita for both Friday and Saturday. I usually handicap cards a half hour or less before post time, so yes, I'm taking things seriously this time out. Still, handicapping these races are very difficult because of all of the chaotic factors associated with things like polytrack, recency, big fields, European shippers, etc. In the Classic, I really like Quality Road. He looks like he is on the improve. Sloppy tracks cloudy his form. He is nearly undefeated on a fast track, and he is undefeated on artificial surfaces (OK, he is zero for zero on poly but Elusive Quality sired horses are no slouches on plastic). He looks like he is made for this race. He'll be close enough to the pace, and is also capable of very good late pace numbers. 35 days off is my only concern. Summer Bird got a better trip, and was under urging for a good chunk of the race as well. Quality Road just came up short. He might not come up short on Saturday. A horse familiar with the track, Colonel John, cannot be overlooked. He is very similar in style to Quality Road, but the 126 pounds may hurt him at this distance, though that wasn't the case in the Travers. I really don't like Zenyatta. I even doubt she will hit the board. Her figures are inferior to at least 3 of the known horses, and there are a couple of European invaders who, if they transfer their numbers to the poly, will be very tough as well. If you bet on favourites on either day this year, you better love them, and I mean love them. I'm expecting the payouts to be large in most Breeders Cup races. Click here for long shot plays worthy of having on your exotic tickets. I really think Rachel Alexandra (how is that for stating the obvious?) would have jogged in the Ladies Classic, and Zenyatta will probably have wished she went there instead. Click here for picks by members of the Thoroughbred Bloggers Alliance. If you bet at Woodbine, through HPI, or at a track that is affiliated with HPI, you better expect lower than track payoffs if you hit a triactor or Pick 3, etc. Woodbine Entertainment is no fan of lower takeouts, and California has some of the lowest takeouts in horse racing (15.43% on WPS and 20.68% on all other bets). Woodbine has deemed that their takeout on triactors, supers, Pick 3's, Pick 4's, etc. are totally unacceptable, so they ramp up the takeout for their valued customer to reflect a 25% takeout. You'll notice that Woodbine actually paid higher for the exactor and double. This is because in Ontario, prices are rounded down to the dime on $2 based payoffs. In most of the states, prices are rounded down to the nearest 20 cents on every 2 dollar based payoff. So one out of two times roughly, you can actually get a better payoff at Woodbine by a dime on exactors, doubles and WPS winning bets. But the horrendous part is that if you are fortunate enough to cash something else, and something that pays real money, you will get around 93.9% of the actual payout if you cash through HPI. Yeah, I've heard the argument that Canadians don't have to pay withholding and that horse race winnings are tax free in Canada. But how many people win in the long run anyway? Not many, especially those who play without substantial rebates. Canadian tax laws are no excuse for Woodbine's pompous disdain and larcenous behaviour it has for its customer. If Woodbine can't justify paying track odds, they shouldn't take the signal. They are ripping off, for the most part, an unsuspecting public, and showing absolutely no respect to those who know the scoop. If you hit a triactor that pays $3000 for a buck at Santa Anita on a Breeders Cup race on Friday or Saturday, you will receive only around $2817 through HPI or at Woodbine or one of their affiliated teletheatres, etc. That is a complete rip off, and I don't understand how they get away with it, but they do. Another ridiculous rule that hasn't been rectified is the fact that if you bet through a Canadian ADW or at a Canadian track you can't bet 10 cent, 20 cent, or 50 cent bets when that is in fact the minimum for certain bets at almost every track. If you want to play, you have to make the base bet at least a dollar. But don't think this is just affecting Canadians. If you bet through a US ADW on a Canadian track offering bets that have less than a dollar base, you can't take advantage of the lower minimums in this case either. 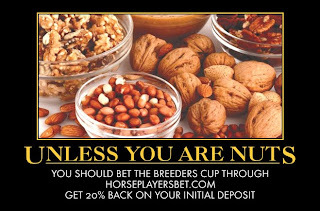 Horseplayersbet.com has a fantastic promotion going on right now: A 20% match on your initial deposit (for deposits up to $1000). This means that if you open a Horseplayersbet.com account and deposit $500, once you bet $500, you will get $100 placed in your account (within 72 hours). And to make things really easy Horseplayersbet.com has waived the Debit and Credit Card fee of 4% on deposits of $100 or more. You can also fund your account immediately with Green Dot as well. ACH's take three business days to clear. Horseplayersbet.com is available to residents of 30 states in the USA, and is 100% parimutuel. Great betting interface, and free live video as well. Not available to residents of Canada. Horseplayersbet.com also has one of the best Player Rewards Program available to even the smallest player. Ah yes, the good ole days. In Hollywood, when someone needed money desperately, and/or in a hurry, one of the only options was to go to the track and bet like a maniac. The only other real competition to this was robbing a bank. I was reminded of this, on Halloween night. My job was to be in the kitchen on high alert, waiting for kids to come to door, so I could hand out candies and make sure my dog was reminded not to bite little people in scary costumes, though I don't blame her for being freaked out. One of the US channels was playing and Addams Family marathon. It was one of my favourite shows when I was a kid. It is funnier today than it was back then by the way. The episode played at around 8ish and was named The Addams Family Splurges. Bored and looking for excitement, the Addams Family decide that going to the moon would make for a great holiday destination. They consulted their home built computer (Whizzo) to find out how much such a trek would cost and found it to be slightly over a billion dollars (seeing the computer in action gave me a deeper appreciation for the Google search engine). In short, they decide to make the billion at the track, using selections from the computer. The idea was to start with $2000 and parlay until the billion was made. "I seem to remember having an extra couple of thousand to bet with lying around here somewhere." Classic. Now of course, there was obvious silliness and things that made no sense like when Fester wondered where the money went and was told it is in a safe at the bank. Or the idea that they were negotiating canceling the bet when there weren't cell phones (or mentions of them back then). And those Hollywood stretch runs that last over a minute are a pet peeve of mine, as well as when they change the horse and/or its position when switching from those viewing the race to the actual race itself. And those quick DQs too just make me cringe. The best part of the episode though, is that an $8 million bet wouldn't affect the odds of a 100-1 shot. Racetracks across the world would love that to be the case. JCapper may be great software today, but it just can't come close to competing with Whizzo. One more thing. Does anyone have any idea which track was being shown in the episode? Hialeah? Tropical Park? On a serious note, lets hope the condition of Canadian born jockey Julia Brimo improves. She fell down hard in the first race at Keeneland on Saturday. At latest report she is still in critical condition. Also, check out the New Deal as proposed by Pompano racing exec John Berry. Cutting takeout to 12% throughout the industry would be fabulous. Where Berry comes up short is the real reason this would be successful and how it would lead to actual growth. Horseplayers will last longer, which means they will devote more time gambling on horses, which will inevitably draw in friends, family and/or coworkers to the game as well. At least it ups the chance that they will get exposed to horse racing. Also, the odd long term winner will be created, and this will inevitably draw in new players as well be it word of mouth or the internet. The reason slots are so successful is that they get the odd newbie because of an addicted family member or friend. But if the addicted person had to face an 80% payback, they wouldn't go nearly as much if at all eventually. In his example, he is saying that there will be an additional $50,000 lost by patrons each day. Yet he contends that bettors will be leaving with more money each day. So it is contingent on bettors playing a lot more often, and it implies new players coming in, because bettors don't have a bottomless pit of money. In a nutshell, his idea would work, but not for the only reason he cites. Good interview by HANA with a Betfair exec. It is a must read. Good move by the Breeders Cup. I'm still not sure this deal benefits Betfair though, because allowing its customers to bet into large takeouts will cause many of their customers to lose too quickly and may cost them customers in the long term, just as North American racing has managed to do over the last 40 years. Steve Davidowitz article up at Trackmaster (free registration required). His view on how to solve racing's most pressing problems. Takeout takeout takeout. OK, not just that.